Bangladesh Prime Minister Sheikh Hasina speaks to the media after casting her vote in Dhaka yesterday. BANGLADESH PRIME MINISTER Sheikh Hasina has been declared the landslide winner of an election marred by deadly violence that the opposition slammed as “farcical” and rigged. Hasina’s ruling Awami League party and its allies won 288 seats in the 300-seat parliament, with the main opposition securing only six seats, Election Commission secretary Helal Uddin Ahmed said today. Yesterday’s vote, which hands Hasina a record fourth term, was overshadowed by clashes between rival supporters that killed at least 17 people and allegations of ballot box stuffing and intimidation at polling stations. 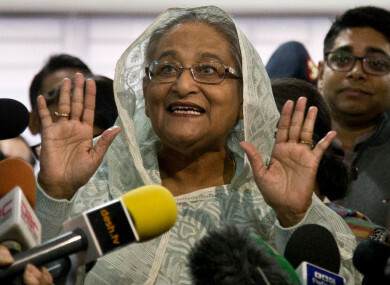 Hasina’s government had mounted a crackdown on the opposition, an alliance led by the Bangladesh National Party (BNP), which urged the country’s election commission to void the results. Hasina (71) has been lauded for boosting economic growth in the poor South Asian nation during her decade in power and for welcoming Rohingya refugees fleeing a military crackdown in neighbouring Myanmar. But critics accuse her of authoritarianism and crippling the opposition — including arch-rival and BNP leader Khaleda Zia, who is serving 17 years in prison on graft charges. The opposition alliance accused Hasina’s party of using stuffed ballot boxes and other illegal means to fix the result. BNP spokesman Syed Moazzem Hossain Alal said there were “irregularities” in 221 of the 300 seats contested. Bangladesh election commission spokesman SM Asaduzzaman told AFP the body had “received a few allegations of irregularities” and was investigating. Hasina has not responded to the accusations but said in the run-up to the vote that it would be free and fair. The opposition said the unrest was stirred up to deter voters, and presiding officers reported a low turnout across the country. The ballot was announced on 8 November. Indian Prime Minister Narendra Modi called Hasina to congratulate her on the win, according to the Bangladesh leader’s press secretary, becoming the first world leader to do so. What is the point of saying anything? We have to accept the results and the fact we have a crippled opposition. Thirty-five of its candidates were either arrested over what they said were trumped-up charges or disqualified from running by courts, which Hasina’s opponents say are government controlled. Hasina’s victory secures her third consecutive term in office, and fourth overall. A daughter of Bangladesh’s first president Sheikh Mujibur Rahman, Hasina was gifted victory in the 2014 election when the BNP boycotted the vote claiming it was not free and fair. Email “Bangladesh prime minister re-elected amid violent clashes in which at least 17 people were killed ”. Feedback on “Bangladesh prime minister re-elected amid violent clashes in which at least 17 people were killed ”.